Perdido Key Florida condominium for sale at Florencia. Penthouse - 6 bedrooms, 5 1/2 baths and private office with impressive solid mahogany double door entrance. 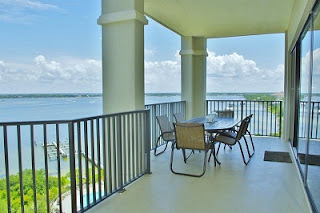 Unobstructed panoramic views of Ole' River and Intracoastal waterway with short walking distance to beach. Exceptional covered parking spaces: Two (2) covered parking spaces under the building and one (1) large storage room. Unparalleled amenities: heated indoor and outdoor pools, exercise gym with sauna & steam room, owner's lounge, docks, kayaks racks on Ole River, beautiful landscaped grounds for enjoyment, bike trail outside gated entrance leading to a golf course, restaurant. Holiday Harbor marina and convenient beach access. The Perdido Key weather provides a variety of outdoor activities throughout the year.